Before Chris Anderson bought it in 2001, the TED conference was like a hip indie band only the in-crowd knew about. It was cool, small, had incredible buzz, and always sold out its small-ish venue. An unabashedly for-profit jam, TED had never posted a video online (2001 was too early for that), and happened once a year in Monterrey, California. Chris Anderson on the TED stage, where he spends an enormous amount of his time. What a difference a decade and a half makes. 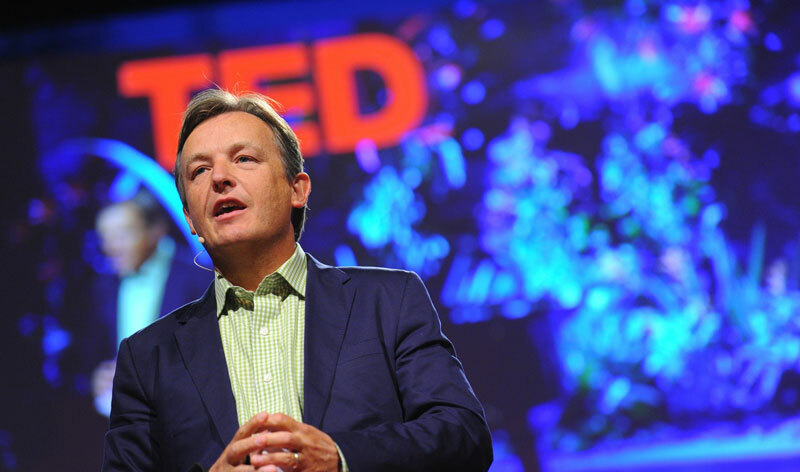 TED videos are now viewed 2.5 billion times per year, and volunteer-organized TEDx events – many of them far larger than the main conference – take place somewhere on our planet ten times a day. And TED no longer funnels earnings to an owner, but pours every dime earned from its cash cow of a main conference into spreading ideas, free of charge, to anyone and everyone on Earth. Though I’ve known Chris for decades and have spent hundreds of hours in conversation with him, I learned quite a bit from this interview. I hadn’t realized he’d spent much of his childhood in a mud hut in Pakistan, heard the full story of shedding his once-fervent Christianity, nor gotten quite so deep into the evolutionary psychology of memes. I already knew most of what we touched on regarding TED – but I’m near the expert level on that topic, so most listeners will learn plenty from that discussion as well. Though he’s shed the religiosity he was raised with, Chris retains a certain missionary-like commitment and fervor. When this radiates through TED, some embrace it as idealism whereas others dismiss it as earnestness. But whatever your take on TED’s energy, it’s hard to be cynical about Chris’s generosity in connection to it. He bought the conference with money earned from his business career, which he sequestered into a foundation, which now owns and runs TED as a not-for-profit. He has since spent sixteen years working extreme hours in a highly stressful job for no salary, transforming TED into the idea-dissemination engine it now is.